Normally when I hear the words gluten-free I cringe up my nose and say "No Thank You" to the offer of a taste. But I'm slowly coming around because I've become more aware that gluten-free doesn't always mean it won't taste good too. Simply Shari’s gluten-free cookies are actually one of the foods that got me to start changing my way of thinking. I mean who would pass up the chance to try a cookie?! Right?! Well I sure didn't, and I'm glad I took the leap because these are actually really good. So good my son took off with a bag and at the entire thing himself without sharing. I guess I can't be too upset with him though because these are so much better for him then other cookies on the market. Of course I wasn't about to tell him that when he was devouring them. I just let him believe they were an every day cookie. Now it looks like I'll have a new sweet reward to stock up on though because now he's asking for more. And as a mom I'd rather him enjoy these for a treat than cookies filled with who knows what ingredients. 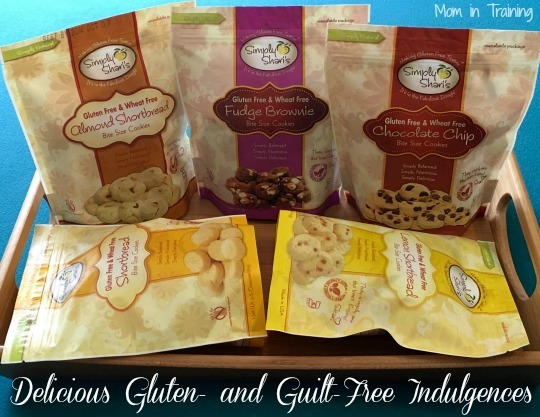 Simply Shari’s gluten-free cookies are made of the finest and freshest ingredients you can trust and are packed with flavor and texture you can only imagine. Never before has a gluten-free shortbread cookie tasted so buttery! All of our products are made with real butter giving it chewy, moistness and superior taste. Creator Shari Cole is a firm believer that using butter is important in baking. When a cookie is made of pure butter and combined with the perfect blend of gluten free flours, something magical occurs. Our shortbread cookies are simple yet have an amazing ability to satisfy. Our ingredients are clean and GMO-free and we ensure every cookie turns out perfectly. Simply Shari’s proudly displays the Celiac Sprue Association (CSA) Recognition Seal and the Certified Gluten-Free (GF) Seal that show our products are tested and certified gluten free — now many fatigued celiac and gluten sufferers have a tasty snack to nibble on. The amazing Simply Shari’s cookies are available in plain, zesty lemon and aromatic almond. We also offer delicious chocolate chip cookies and fudge brownies that your entire family will crave. These wonderful treats are great with ice cream, afternoon tea and much more! Prices range from $4.99-$5.99. I have never tried a gluten-free cookie before but these do sound really good. It's great when something healthier also tastes good too. I'd love to try the fudge brownie flavor! These look delicious! I love anything gluten free!